Six primary types of USDA business loans and grants are available to businesses in rural areas (populations under 50,000). Approved lenders typically offer up to $10 million for the most popular USDA B&I loan program, with interest rates of 6 percent to 9 percent, and repayment terms of up to 30 years. The six programs offered through USDA include USDA Business & Industry Loan Guarantees, Rural Energy for America Program Loans and Grants, Value Added Producer Grants, Rural Business Development Grants, Rural Microentrepreneur Assistance Program Loans, and Intermediary Relending Program Loans. USDA B&I Loans – For rural businesses needing up to $10 million for most business needs. Rural Energy for America Program (REAP) Loans/Grants – For rural businesses in need of energy efficiency upgrades (renewable energy systems, insulation and heating upgrades, and replacement of energy inefficient equipment) can receive loans up to $10 million and/or grants up to $500,000 directly from USDA. Rural Business Development Grant (RBDG) – For nonprofit corporations, towns/communities, state agencies/authorities, institutions of higher education, or federally-recognized tribes to expand community/economic development through training and technical assistance, acquisition and development, pollution control, and to conduct feasibility studies. Intermediary Relending Program (IRP) – For rural businesses that are not eligible for conventional financing, funds can be used for most business needs. Rural Microentrepreneur Assistance Program (RMAP) – Loans and grants for rural microbusinesses (businesses with 10 or fewer full-time employees) in need of working capital up to $50,000. USDA Business and Industry (B&I) Loans are the most accessible of the business loans offered by USDA. The maximum loan guarantee amount for USDA B&I Loans is typically $10 million. Funds can be used for modernization and development of an existing business, purchase of real estate/equipment, refinance existing debt, or acquisition that will preserve jobs. USDA Business Loans work well for most businesses, provided that the business is in a rural area. USDA defines a “rural area” as a city or town with a population of less than 50,000 inhabitants. USDA Business Loans have generous maximum loan limits, can be used for a vast array of purposes that cover the majority of business needs, and have some of the lowest interest rates on the market (presently in the 6 percent to 9 percent range). USDA B&I Loans are offered through traditional banks or community development financial institutions. The USDA provides a guarantee on these loans to the bank, promising that it will repay a specified portion of the loan in the event that you default on the loan obligation. This protects the bank from potential loss, and rewards the business borrowing the funds with lower interest rates than you may otherwise be eligible for without the USDA guarantee. USDA B&I loans offer various borrowing options that have slightly different loan terms, ranging from seven to 30 years, depending on the loan purpose. Typical interest rates for USDA Business Loans fall between 6 percent and 9 percent, and cannot exceed the interest rates that the bank would customarily charge borrowers for loans without guarantees. Repayment terms for USDA Business Loans vary based on what the loan is being used for. Loans for working capital are limited to a seven-year repayment term, loans for machinery and equipment can have terms up to 15 years, and real estate loans have a 30-year term. Regardless of the loan term, the loan must be fully amortized over the course of the loan with no balloon payment at the end. Loans with balloon payments reduce the payment amount over the term of the loan, which leaves a lump sum payment due at the end of the term known as a balloon payment. This large payment at the end of the term is often burdensome to the borrower. Loan amounts exceeding $10 million require an exception from the USDA Administrator. The USDA Rural Development specialist that you are working with will submit your loan request to the Administrator on your behalf. Approval is at the sole discretion of the Administrator and may be dependent on the available funding at the time of the request. The typical requirements for a USDA B&I loan include a debt service coverage ratio of 1.25x or greater, a credit score of 680+, personal/corporate guarantees from majority owners, sufficient collateral to cover the guaranteed portion of the loan, and tangible balance sheet equity equivalent to 10 percent to 20 percent at the time of loan closing. Good Ability to Repay the Loan: The proposed operation must have realistic repayment ability, with a typical debt service coverage ratio (DSCR) of 1.25x or better. Feasibility Study: New enterprises will be asked to obtain a feasibility study by a recognized independent consultant, based on your business plan. Good Credit: The business and its owners must have a good credit history as indicated by a credit score of 680 or greater. 10 percent to 20 percent Tangible Balance Sheet Equity: At loan closing/project completion, the business must have a tangible balance sheet equity position of 10 percent or more for existing businesses or 20 percent or more for new businesses. Personal and Corporate Guarantees: Personal and corporate guarantees are normally required from all proprietors, partners, and major shareholders who have greater than 20 percent ownership interest in the business. Collateral: Collateral must have documented value sufficient to cover the amount of the guaranteed portion of the loan: 80 percent loan to value or greater. Applying for a USDA B&I Loan can be a very daunting process, and requires that a large amount of documentation be provided. The average duration from the submission of the initial application (by your lender to USDA Rural Development) to funding is 30 to 60 days, which means the overall process is actually more like 45 to 90 days. While most lenders are eligible to become an approved lender for USDA Business Loans, choosing a lender that is well versed in this process can help ease some of the burden and get your loan funded more quickly. Before starting the application process, ask the lender how many of these loans they have made to determine their familiarity with the program and the process. If you already have a very strong banking relationship with a specific lender, but they are not currently an approved lender for USDA Business Loans, they can apply with USDA Rural Development to become an approved lender by contacting the local USDA Rural Development State Office. If you haven’t already chosen a lender to work with for your USDA B&I Loan, you can try to find one that is active in your area. Many of the lenders that are approved for the USDA Business Loan Program are approved to make loans nationwide. Below is a list of the ten most active USDA B&I Lenders (by loan amount) for fiscal year 2018. The Rural Energy for America Program (REAP) provides guaranteed loans and grants to agricultural producers and rural small businesses to purchase/install renewable energy systems or make energy efficiency improvements. REAP loans, with interest rates ranging from 6 percent to 9 percent, can be obtained through participating lenders, and grants can be obtained directly through USDA. If you are operating a business in a rural area (a city or town with a population of less than 50,000 people), and your business could benefit from a renewable energy system or other energy efficiency upgrades, this USDA business loan and grant program may benefit you. These USDA business loans and grants can be used to replace old equipment with more energy efficient models and various other energy improvement and energy efficiency projects. Loan funds may be used for renewable energy systems (e.g., wind or solar). Loan funds may also be used for the purchase, installation, and construction of energy efficiency improvements (e.g., high-efficiency heating). Rural Energy for America Program Loans offer various borrowing options with varying loan terms depending on the loan purpose. Repayment terms for this type of USDA business loan range from seven years to 30 years contingent on the use of the loan funds. REAP Loan interest rates are typically in the 6 percent to 9 percent range, but may vary by lender. Repayment terms for REAP Loans vary based on what the loan is being used for. Loans for working capital are limited to a seven-year repayment term, loans for machinery and equipment can have terms up to 15 years, and real estate loans have a 30-year term. Regardless of the loan term, the loan must be fully amortized over the course of the loan with no balloon payment at the end. To be eligible for a Rural Energy for America Program loan, you must be a rural agricultural producer with a debt service coverage ratio of 1.25x or greater, have a personal credit score of 680 or greater, and have a completed technical report (detailed scope of work pertaining to the project) and a certified energy audit. Agricultural Producer: The borrower must be an agricultural producer or a rural small business. Good Ability to Repay the Loan: The borrower must have realistic repayment ability as indicated by a debt service coverage ratio of 1.25 or greater. Good Personal Credit: The business and its owners must have a good credit history, as indicated by a credit score of 680 or greater. Technical Report: Projects greater than $200,000 require a technical report. A technical report is a detailed scope of work that describes the project, the technology being used, the location of the project, and the site of installation. Energy Audit: Energy efficiency projects require an energy audit or assessment conducted by a certified energy auditor. REAP grant applications are competitively funded. All applications are ranked and scored based on a pre-described scoring criteria listed in the federal regulation pertaining to this program. Scoring criteria for these USDA grants can be found in the federal regulation governing this program. The higher your application scores based on these factors, the greater the likelihood that your grant will be funded. If your rural business could benefit from a renewable energy system, an upgrade to an existing renewable energy system, or energy efficiency upgrades, you may be eligible for these programs. Applications for both the loan and grants program are accepted year-round. To obtain an application package, contact your local USDA Rural Development State Office. Grant applicants must meet the appropriate application deadlines for the grant type that they are applying for. Grant deadlines and application requirements for the Rural Energy for America Program can be found in the Notice of Solicitation of Applications for FY 2019 that was posted in the Federal Register on August 14, 2018. The USDA Rural Development’s Value Added Producer Grant program is aimed at a smaller niche market borrower. Planning grants up to $75,000 and working capital grants up to $250,000 help agricultural producers enter into value-added activities related to the processing and/or marketing of their products. These grants are open to independent agricultural producers, agricultural producer groups, and cooperatives of farmers or ranchers. The production of a product in a manner that enhances its value (such as organically-produced products). The physical segregation of an agricultural commodity or product in a manner that results in the enhancement of the value of that commodity or product (such as an identity-preserved marketing system). Planning activities such as feasibility studies, developing business and marketing plans for the proposed value-added product. Working capital expenses related to producing and marketing a value-added product. The VAPG program offers Planning Grants up to $75,000 and Working Capital Grants up to $250,000. Applicants must be agricultural producers or farmer/rancher cooperatives. The applicant producer(s) must supply at least half of the commodity needed for the project and demonstrate that the project will expand the customer base and increase revenues. Grant funds can be used for planning or working capital expenses related to producing and marketing a value-added agricultural product. Examples of planning activities include feasibility studies and developing business plans for processing and marketing the proposed product. Examples of working capital expenses include processing costs, marketing and advertising expenses, and some inventory and salary expenses. Up to 50 percent of the matching funds may come from the farmer’s own time and effort. Annually, USDA publishes a Notice of Funding Available (NOFA), or Notice of Solicitation of Application (NOSA), in the Federal Register inviting eligible applicants to apply for value-added producer grants. The NOFA/NOSA establishes the timeline for application submission, typically 60 to 90 days from the date of publication, as well as detailing all of eligibility requirements. SF 424 – This is a standard application for federal assistance. SF 424A – This accompanies the SF 424, and provides the budget for your proposed project, along with a list of other funding sources. SF 424B – This document is a certification that you have the legal authority to apply for the program, and that you agree to follow the terms of the program. AD 3030 – This document is a certification that you have not been convicted of a felony and that you are not in default on any federal obligations. Executive Summary – A one-page Executive Summary describing the project. Abstract – A 100-word Abstract describing your project. Grant applicants must meet the appropriate application deadlines for the grant type that they are applying for. Grant deadlines and application requirements for the Rural Energy for America Program can be found in the Notice of Solicitation of Applications for FY2019 that has not yet been released. The Notice of Solicitation of Applications for FY2018 was published in August 2017, and gave an application deadline of January 2018. Rural Business Development Grants are designed to support activities leading to the development or expansion of small and emerging rural businesses. Eligible business development activities for these USDA Rural Development grants are separated into enterprise type or opportunity type grant activities. Enterprise grants typically range from $50,000 to $500,000, while opportunity grants offer a maximum grant amount of $50,000. Small and emerging private rural businesses (including minority-owned businesses) are defined as businesses that have fewer than 50 employees, less than $1 million in revenues, and are located in rural areas. Opportunity grant funds are typically sought after by borrowers seeking to engage in community economic development; these funds are reinvested in local businesses to foster economic growth. Enterprise grant funds are most often issued with a defined focus, such as strategic planning, conducting feasibility studies, or creation of business plans. For Rural Development Business Grants that fall under the “enterprise” grant category, there is no maximum grant amount; however, smaller grant requests are given higher priority. USDA Rural Development grants in this category typically range from $50,000 to $500,000. For grants that fall under the “opportunity” grant category, the maximum grant amount cannot exceed $50,000. USDA Rural Development grant recipients must be nonprofit corporations, rural cooperatives, towns/communities, or state agencies/authorities located in a rural city or town. Enterprise grants can be used for acquisition, construction, renovation, and purchase of machinery and equipment. Opportunity grants can be used for community economic development activities, feasibility studies, creation of business plans, and strategic planning. All applications are evaluated based on evidence of local job creation, percentage of non-federal funding committed, economic need in the area, consistency of the proposal with local economic development priorities, and the grantee’s experience with similar efforts. RBDG grant funds are allocated to the USDA State offices annually and announced to the public through a Notice of Solicitation of Application. The application deadlines for the Rural Development Business Grant vary by state; for fiscal year 2018, Vermont’s application deadline was February 15, 2018, while New Mexico’s application deadline was April 30, 2018. Interested parties should contact the business programs staff to find out the application deadlines in the state where your project is located. While your small business may not be eligible to apply for these grants directly through USDA, you could still benefit if an agency or organization in your area received grant funding through this program. For example, if a local nonprofit received a Rural Development Business Enterprise Grant to supplement their revolving loan fund, you may be able to apply for a loan from that nonprofit to help your small business obtain a loan for startup or working capital. You can inquire with your local USDA Rural Development office to find out who the recent USDA Rural Development grant recipients were, and if the scope of their grant proposal included funding that may be beneficial to your business. Rural businesses can apply to the Intermediary for loans up to $250,000. Interest rates for this type of USDA business loan are set by your lender (referred to as the “Intermediary” by the USDA) and range from 0 percent to 6 percent. The maximum repayment term is 30 years. Borrowers must be in a rural area, in good standing with the government, unable to obtain credit elsewhere, and have no interest/authority in the Intermediary. The Intermediary Relending Program (IRP) provides low-interest loans to nonprofits and public bodies that then re-lend those funds to local businesses and communities to stimulate economic and community development in rural areas. USDA business loan funds under the IRP program can be used for the acquisition, construction, enlargement, or repair of a business or business facility, particularly when jobs will be created or retained. The rates, terms, and payment structure on this type of USDA Business loan are set by the lender in an amount sufficient to cover the cost of operating and sustaining the revolving loan fund; as such, the interest rates on loans from the intermediary are typically less than you would receive through traditional lending sources, and are typically in the 0 percent to 6 percent range. The maximum loan amount from the intermediary is $250,000 or 75 percent of the total cost of the ultimate recipient’s project for which the loan is being made, whichever is less. Eligible borrowers may be individuals, public or private organizations, or other legal entities whose business’ majority ownership is held by U.S. citizens or permanent residents. No legal or financial interest or influence in the intermediary. If your small business is an eligible borrower through this program, contact the IRP lender in your area directly to find out about their application process. To find out which organizations in your state are currently operating an Intermediary Relending Program, contact the USDA Rural Development State Office for the state where your business is located. The Rural Microentrepreneur Assistance Program provides funds to Microenterprise Development Organizations (MDOs), which then provide microloans (up to $50,000) through a revolving loan fund for startup and growth, training, and technical assistance to microbusinesses. Microbusinesses receive loans up to $50,000, at interest rates from 5 percent to 8 percent, with loan terms up to 10 years. Microbusinesses are defined as rural businesses with 10 or fewer full-time employees. To be an eligible microbusiness, the business must be located in a city or town with a population of 50,000 or less. Loans through this USDA business loan program are intended to help a microbusiness grow through additional working capital, refinancing of existing debt, the purchase of equipment and/or supplies, or to improve the business’ facilities. Rural Microentrepreneur Assistance Program loans have a maximum loan amount of $50,000. The interest rates for these loans are set by your lender, with fixed rates typically ranging from 5 percent to 8 percent. Loan terms under this USDA business loan program may not exceed 10 years. Loan Amounts: Up to $50,000. To be eligible for a USDA business loan funded by the Rural Microentrepreneur Assistance Program, businesses must be located in an eligible rural area (a city or town with a population of 50,000 or less) and have 10 or fewer full-time employees. A minimum down payment of 25 percent of the total project cost is required. If your small business is an eligible borrower through this USDA business loan program, you can contact the Rural Microentrepreneur Assistance Program lender in your area directly to find out about their application process. To find out which organizations in your state are currently operating under the Rural Microentrepreneur Assistance Program, you can contact the USDA Rural Development State Office for the state where your business is located. 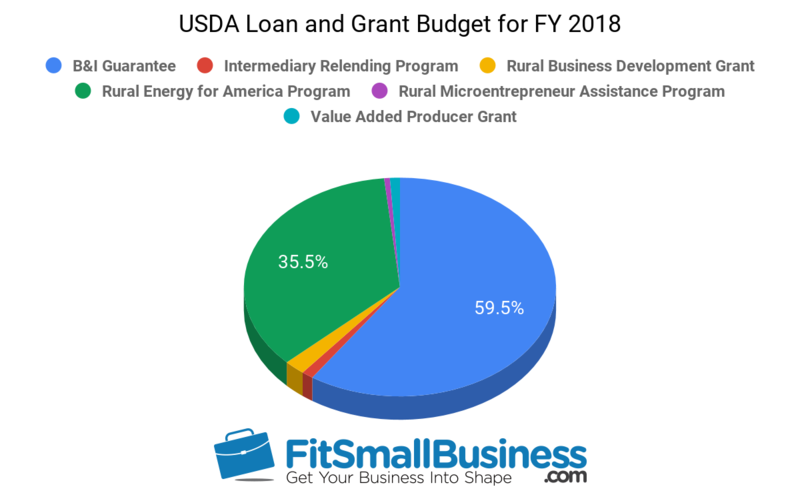 Funding for these six USDA business loans and grants programs discussed in this article, including the most popular USDA B&I loan, is set annually by Congress as part of the overall federal budget approval. Congress has yet to pass the FY 2019 budget appropriations, but based on current renditions of the federal budget, it is expected that funding levels for FY 2019 will be very similar to those set for FY 2018. The appropriations for the six USDA programs are compared in terms of the level of appropriations and the number of loans/grants made in each program in fiscal year 2018. USDA B&I loans historically receive the largest level of funding of the six programs we evaluated. USDA B&I Loan funds made up nearly 60 percent of the entire loan/grant allocations, with REAP loans/grants coming in second at nearly 36 percent. Considering that these two programs are among the most popular, it is unsurprising that they are so heavily funded. Both are loan guarantee programs; as such, the federal government is able to have a greater reach with these funds. The cost to the government for a loan guarantee is far less than a direct government loan. Despite the fact that USDA Business Loans make up a higher percentage of the allocations, the REAP program had more loans/grants funded in FY 2017 (final numbers for FY 2018 have not yet been released). Given that the dollar amounts per REAP loan/grant are much smaller (averaging $250,000) than those seen in a typical USDA Business Loan (averaging $3 million), the significant difference in the number of loans/grants funded in a year is logical. You’re likely wondering how a USDA small business loan and an SBA loan compare. The SBA 7(a) loan and USDA B&I Loan are very similar. Both offer loan guarantees (promise to the lender to pay the remaining loan balance in the event that you default), but they are administered by different government agencies with slightly different requirements. The USDA B&I Loan program is specifically targeted to rural businesses. Plus, the fee structures and loan limits of the two programs are different; USDA B&I loans offer higher lending limits ($10 million versus SBA’s $5 million), slightly longer repayment terms (30 years versus SBA’s 25 years), and a fixed guarantee fee versus SBA’s variable guarantee fee. The loan guarantee, issued by either USDA or SBA, results in more favorable rates and terms for the borrower, as much of the loan risk is shifted from the bank to the government agencies issuing the guarantee. With both the USDA B&I loan and the SBA 7(a) loan, the loan is not being made through the federal agency, but rather through a separate lender. In both cases, the government is guaranteeing to repay a percentage (60 percent to 80 percent) of your loan to the lender in the event that you default. The guarantee serves as a form of insurance to the bank, or other financial institution, that is providing you credit. This guarantee provides security of repayment to the financial institution and allows them to offer you more favorable lending terms as a result, often in the form of lower interest rates and fees than you would qualify for without the guarantee in place. SBA loan rates are generally similar to USDA B&I rates, though there is some variance depending on the lender you choose. USDA Rural Development offers six very different USDA Business loans and grants, aimed at fostering the growth and development of business in rural America. Each of these programs is aimed at a specific niche business market, and offers various ways for rural small businesses to obtain financing that may not otherwise be available. The most popular of the six loan and grant products discussed in this article is the USDA B&I loan. This loan option has the broadest loan use eligibility and least restrictive borrower eligibility requirements. 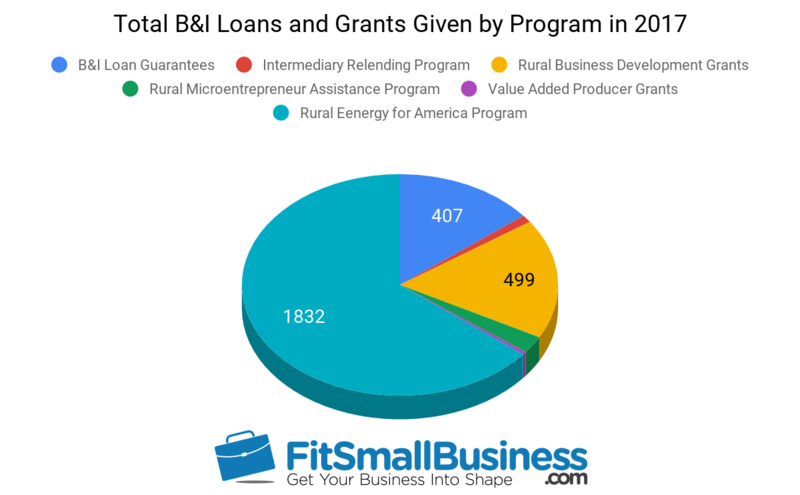 The second most popular of the USDA business loans and grants is the Rural Energy for America Program loans/grants; the eligibility criteria for this program is similar to the requirements of the B&I loan program, but the funds are reserved for energy efficiency improvements for small businesses. USDA B&I loans are typically up to $10 million, and can be used to finance working capital, refinance existing debt, or purchase a business, real estate, or equipment. USDA B&I loans are good for borrowers with a solid credit history who are in need of long-term capital. The Rural Energy for America Program offers loans up to $25 million and grants up to $500,000 to finance renewable energy systems and energy efficiency upgrades for rural small businesses. USDA business loans and grants offered through the REAP program are best for borrowers with a solid credit history and a need for long-term capital to improve energy efficiency. The Value Added Producer Grant is a competitive grant process that offers planning grants up to $75,000 and working capital grants up to $250,000. The purpose of this USDA business grant program is to help agricultural producers enter into value-added activities related to the processing and/or marketing of their agricultural products. VAPG grants are available to agricultural producers and farmer/rancher cooperatives. The purpose of the Rural Development Business Grant is to help rural small businesses start up or expand. These USDA Rural Development grants are designed to support the activities of businesses that have fewer than 50 employees and less than $1 million in gross revenues. RBDG grants are awarded on a competitive basis to nonprofits, government entities, and public bodies. Potential borrowers under the USDA’s Intermediary Relending Program may be individuals, public organizations, or private organizations located in rural areas. Borrowers must be in good standing with the Federal Government and be unable to obtain affordable commercial financing for the project elsewhere. Under this USDA business loan program, loan funds can be used for acquisition and construction, purchase of equipment, machinery, and supplies, startup costs, and working capital. Under the Rural Microentrepreneur Assistance Program (REAP), approved non-profit lenders provide loans up to $50,000 at interest rates ranging from 5 percent to 8 percent, with a maximum 10-year term. This type of USDA small business loan is intended for the startup and growth of rural microbusinesses. Loan funds can be used for working capital, debt refinancing, purchase of equipment and supplies, and to improve real estate. Loans to the ultimate recipients are limited to 75 percent of the proposed project cost (not to exceed $50,000), with a fixed interest rate set by the MDO. No loan made to an end recipient will have a repayment term beyond 10 years. While USDA business loans and grants are great opportunities for funding a small business, not all businesses qualify. If your business is not in a rural area, or doesn’t meet the credit or other qualifications, there are other alternatives. This includes SBA loans, alternative business loans, and startup business loans. SBA Loans: If your business is not located in a rural area, but you would otherwise be eligible for a USDA business loan, you may consider a loan through the Small Business Administration. The Small Business Administration (SBA) offers a number of different types of SBA loans for small businesses. Alternative Business Loans: If your small business doesn’t meet the credit and debt service coverage ratios needed to qualify for a USDA B&I loan, an alternative loan may be your solution. Alternative business loans typically have more flexible credit requirements, an easier application process, and a faster delivery of loan funds. We’ve evaluated nine alternative small business financing options for you. Startup Business Loans: It can be challenging to find the right financing for your startup business, and you may not be ready to take on the daunting task of applying for an SBA or USDA business loan. If you are still looking for other financing options for your startup, we’ve evaluated 12 of the best ways to fund your startup. A lot of information has been covered in this article, but the questions that are most frequently asked are in regards to USDA Business Loans and how that process works. If you have any questions about any of the loan and grant programs described here, you can post them in the Fit Small Business forum. What is the application process for USDA business loans? Your application gets submitted to the Rural Development (RD) State Office where your business is located. RD meets with all parties to determine eligibility and the application is reviewed. If eligible, a Conditional Commitment is issued, approving the guarantee subject to conditions. 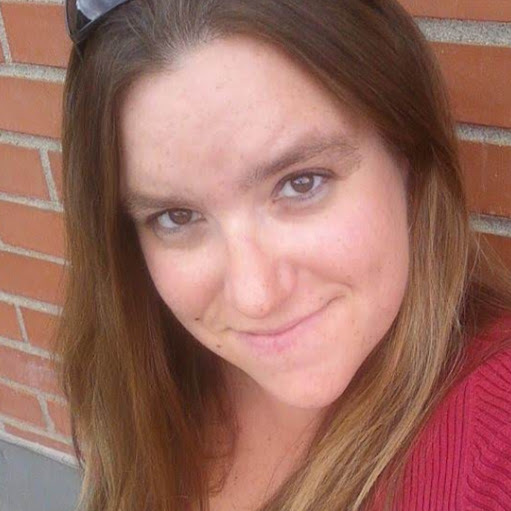 The loan is closed, RD verifies that conditions have been met, and issues the Guarantee. How long does the application process for USDA business loans take? Upon receipt of a complete application, lenders can expect a response from Rural Development within 30 to 60 days. However, response times can vary based on complexity and scope of the proposed loan use. For example, a construction project can take longer due to environmental clearances, whereas a straightforward refinance may be completed in a shorter time frame. How do I know if an area is “rural” by USDA small business loan standards? Borrowers seeking to receive B&I guaranteed loans or grants must be located in eligible rural areas. Rural areas are defined as cities and towns with populations of less than 50,000 people. To determine if your business location is in an eligible rural area, you can enter the address into USDA’s eligibility determination site. What are the benefits of a USDA B&I loan guarantee to the borrower? Borrowers can get loans up to $10 million and benefit from better rates/terms with the B&I guarantee than are typical with conventional loans. Longer terms can reduce loan fees that may be incurred on shorter-term loans or balloon loans. Interest rates may be fixed or variable, and range from 6 percent to 9 percent. What is the typical size of a B&I loan? Typically, USDA Business and Industry loans range in size from $200,000 to $5 million, with an average size of $3 million. USDA Rural Development does not require a minimum loan amount, but loans between $10 million and $25 million require that the Rural Development State Office get an exception granted at the national office level. USDA Rural Development offers business loans and grants that cover many of the diverse needs of rural small businesses. After reading this article, you should have enough information about the six primary USDA business loans and grants to get started. If your business isn’t located in a rural area, or you are simply wondering how to get a small business loan, or if you didn’t read about a program that would meet your needs, there are other financing options available to help support your small business, like an SBA loan, alternative business loans, and startup loans.